For government and military clients that utilize simulation tools, our OptDefTM software adds powerful optimization and analysis capabilities, guiding clients through the process of running simulations, adjusting input values, and analyzing the outcomes. OptDef wraps your simulation model and provides an intuitive user interface for simulation optimization and analysis, design of experiments, sampling, and batch runs. OptDef is a cross-platform, Java application with a plug-in interface that has been integrated with many DoD simulation tools. OptDef improves the affordability, effectiveness and return on investment (ROI) of your simulation models. Simulation models alone can address only “What if…?” questions. OptDef works with existing, unmodified, constructive simulation models to resolve “What’s best…?” questions, such as the best blue laydown to counter a potential red attack, or conversely, red’s most effective strategy against a given blue laydown. OptDef allows an analyst to choose multiple simulation inputs to vary and then apply one or more constraints and objectives. OptDef integrates with both deterministic and Monte Carlo models to optimize your decisions. 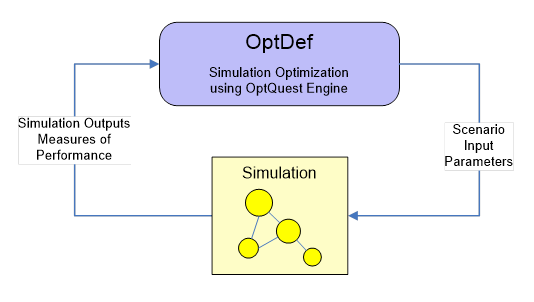 OptDef uses metaheuristic search methods (OptQuest) to drive iterative simulation runs with different simulation input combinations. After the completion of the search, the tool automatically applies different statistical and data mining techniques (OptAnalysis) to provide insight into the influence of the variables on the objectives and to identify good and bad regions of the trade space. OptDef frees the analyst from the labor intensive and inefficient process of repeatedly configuring and running scenarios through the simulation model, empowering them to think strategically about the critical simulation inputs, constraints to place on the scenario, and the objective or objectives to maximize. OptDef can take advantage of multiple CPU/multiple core hardware, and integration is available with High Performance Computing Clusters, enabling OptDef to explore very large trade spaces by driving very large numbers of simulation runs. OptDef is the result of Small Business Innovation Research (SBIR) program funding designed to provide an easy way to externally provide simulation optimization and analysis capabilities. As the result of SBIR funding, OptDef is a government rights tool, and is available at low cost (no cost for OptDef and existing integration layers and minimal cost for embedded off-the-shelf optimization libraries). Its architecture also allows integration with additional simulation tools with limited effort.